Dayondon is planning to sail from Manila to southern China early next year, recreating trade and migration voyages made before Spaniards colonised the Philippines in the 1500s. "People tell me I am crazy. They ask: 'Wow, why climb Mount Everest? 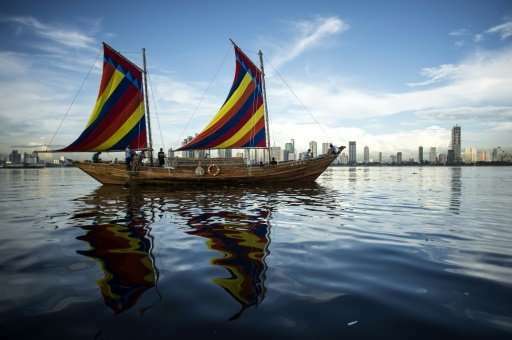 Why go to China on this tiny thing,'" Dayondon told AFP in Manila Bay aboard one of the two boats that will make the expected six-day sailing journey. "I'm excited because our team will be more inspired realising how good our forefathers were. We have to let people know we should be proud of being Filipino," the 39-year-old added. Dayondon, a petite but muscular coast guard officer, created history in 2007 when she and two other countrywomen became the first Filipinas to summit the world's highest mountain. "Like Mount Everest, I want this to be symbolic of what our people can accomplish, of what can be possible out of the so-called impossible," the 69-year-old said. 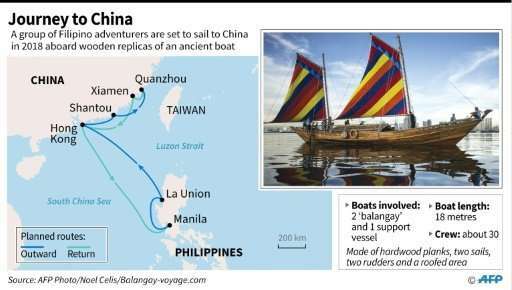 Map showing the planned routes by a group of Philippine adventurers sailing to China in 2018 aboard wooden replicas of an ancient boat. The vessels are a copy of a "balangay", which date back as far as 320 AD. 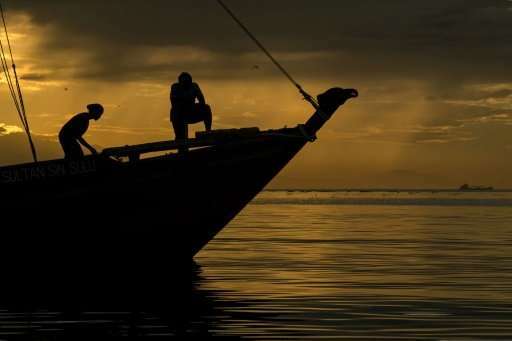 "Early trade with China and Southeast Asia was made possible by watercraft," Ligaya Lacsina, researcher at the National Museum's maritime division, told AFP. "Europeans during the colonial period were effusive in their praise of Southeast Asian boat-building skill. But somehow we've paid very little attention to this." The boats, 18 metres (60 feet) long by three metres (10 feet) wide, are made of hardwood planks, include two sails, two rudders and a roofed area. Their journey to the southeastern Chinese city of Quanzhou will be about 1,000 kilometres (600 miles), and the crew members are aiming to do it with as little modern technical help as possible. "We have no night-sailing capability so we can be run over by a super tanker. That's my fear. The greatest difficulty of replicating an ancient voyage is modernity because there are new port protocols," Valdez said. "This kind of boat is being treated as a maritime hazard." "We sleep anywhere because we don't have quarters. We have no toilet. We just hold the rope and use a harness and do the proper position so we don't fall," she said. Their trip is planned to commemorate a journey made about 600 years ago by a sultan from the southern island of Sulu who went to China to pay tribute to Ming Dynasty rulers there but who but died of an illness on his way home. The voyage to China will be the team's second maritime quest following a 17-month journey that began in 2009 around Southeast Asia. One of the group's biggest challenges is off the water—finding enough money to fund the adventure. "Filipinos love us when we climb Mount Everest, love us with our exploits but they are not willing to pay for that. And that makes us a poorer nation," he said. "Blazing a trail and going beyond what is normal, that is the spirit of a nation. That is how you build a nation, out of a dream."